"Conway and Smith’s book is a wonderful introduction to the normed division algebras … They develop these number systems from scratch, explore their connections to geometry, and even study number theory in quaternionic and octonionic versions of the integers. … a lucid and elegant introduction. … remarkably self-contained. It assumes no knowledge of number theory, string theory, Lie theory, or lower-case Gothic letters." "A resonant spike above background noise in one parameter as another parameter is varied is a frequent indicator…"
"Those readers who are fascinated by the links between geometry and groups will find that this book gives them new insights." 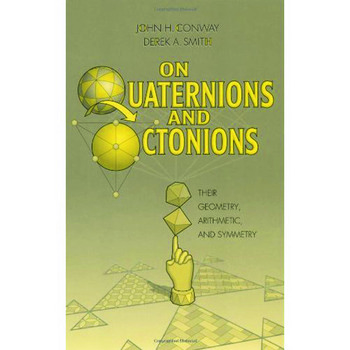 "This is a beautiful and fascinating book on the geometry and arithmetic of the quaternion algebra and the octonion algebra. … most intriguing to read: it is an excellent exposition of very attractive topics, and it contains several new and significant results."